The Mess is a light, open space with moveable walls, exposed roof apex and double height spaces in many areas. “I wanted a contemporary look for the ceiling. I chose Heradesign because I liked its unique wood-wool texture which helps make the rafts visually appealing. The rafts are suspended from the ceiling. Each raft consists of individual Heradesign panels fitted to a concealed grid to give an almost continuous appearance. The rafts create a striking feature thanks to their distinctive woven surface, which in this case is matched to two RAL colours. Heradesign can be specified in an unlimited number of colours – enabling true design freedom. The Mess has a number of potential sources of noise: from the kitchen as well as activity, speech and movement in the dining areas. The rafts are located around or above these areas to absorb sound and minimise disturbance in the quieter areas of the Mess. 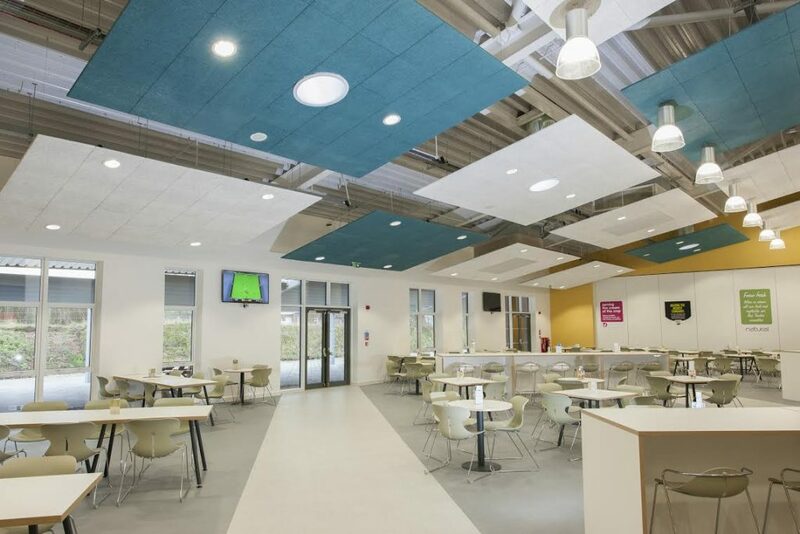 Heradesign has the highest level of sound absorption, Class A, helping improve speech intelligibility and creating a relaxed atmosphere. 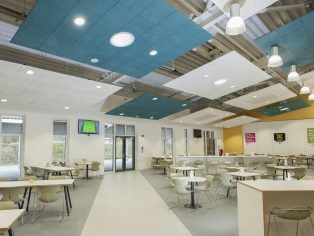 Thermatex Antaris ceilings from Knauf AMF are fitted in the shop and other communal areas. Antaris is a white mineral tile with a very high light reflectance of up to 88 per cent. The light reflecting capacity of Antaris helps improve lighting conditions which contributes to a reduction in energy bills. 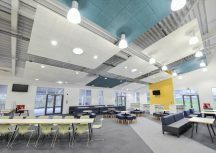 The surface of the tiles diffuses the light coming into the room, reducing glare and providing a comfortable environment in which to work and concentrate.